Discussion in 'Art & Design' started by GBArt, Jun 14, 2009. It seems high time that someone started a thread about Marcel Duchamp. Now, where's my needle. Eliot Elisofon. 1952. © Time, Inc. I surprised that there wasn't a Duchamp thread either, now that you bring it up. i love how he treated art and made it somethng so different. most people dont agree with what he did, kind of the way people think about pollocks work but i love his art. i wouldnt pay that much for a piece of him, well mayeb not in a near future but i do appreaciate the symbolism and the meaning behind it. this is one of my favourites from him and the one hes most commonly known for. I think most people don't understand what he did. Soon after arriving from France in 1915, Marcel Duchamp and Francis Picabia met American artist Man Ray. By 1916 the three of them became the center of radical anti-art activities in the United States. American Beatrice Wood, who had been studying in France, soon joined them. Much of their activity centered in Alfred Stieglitz's gallery, 291, and the home of Walter and Louise Arensberg. The New Yorkers, though not particularly organized, called their activities Dada, but they did not issue manifestos. They issued challenges to art and culture through publications such as The Blind Man, Rongwrong, and New York Dada in which they criticized the traditionalist basis for museum art. New York Dada lacked the disillusionment of European Dada and was instead driven by a sense of irony and humor. In his book Adventures in the arts: informal chapters on painters, vaudeville and poets Marsden Hartley included an essay on "The Importance of Being 'Dada'". During this time Duchamp began exhibiting "readymades" (found objects) such as a bottle rack, and got involved with the Society of Independent Artists. In 1917 he submitted the now famous Fountain, a urinal signed R. Mutt, to the Society of Independent Artists show only to have the piece rejected. First an object of scorn within the arts community, the Fountain has since become almost canonized by some. The committee presiding over Britain's prestigious Turner Prize in 2004, for example, called it "the most influential work of modern art." I think his art could be called "Flip Art", in the sense that he flipped the usual meaning and way of seeing things to something entirely different, and The Fountain, of course, is a great example of that. Personally I think it suggests a very healthy approach to reality, and especially to art. The world we live in is rapidly changing, and Duchamp was profoundly aware of that. Art is a way of making sure we don't get too settled in our ways of thinking about anything. Basically, we constantly have to keep our eyes on the ball or we are sure to miss something. And that can be dangerous. Life is a chess game, and Duchamp wants us to win. I have this theory regarding duchamp and that he was highly envious of the likes of DaVinci, and therefore because he could not match their talents, he ridiculed them and the whole art establishment. 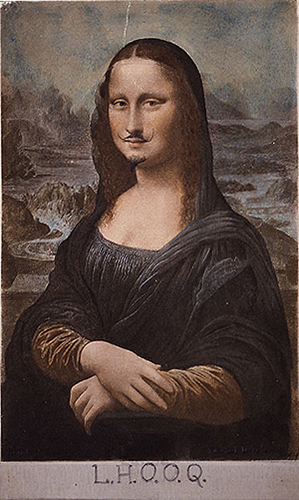 There is only one Da Vinci, and there is only one Duchamp. I am a fan of both. Da Vinci was probably the greatest pure artist, and Duchamp was probably the greatest in saying not to take anything too seriously, including art. Personally, I think Leonardo would be an enormous fan of Duchamp. Possibly one of my favourite artworks ever..
the artwork looked more 'complete' so he allowed it to be kept this way..
Duchamp is pretty interesting, especially his ideas about identity and his clever wordplays. Duchamp was basically the first great surrealist comedian. Totally deadpan and off the wall, he predated Dali, Peter Sellers, the Beatles, and Andy Warhol by about fifty years.